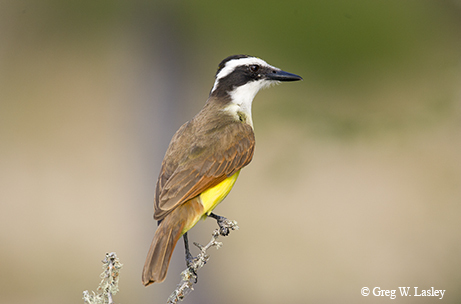 Texas’ eight border-turns offer habitat diversity and birds galore . 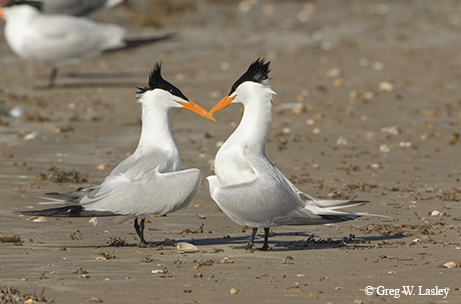 Birders in Texas tend to go to the same places: the upper Texas coast, Big Bend, the Rio Grande Valley. For veteran bird watcher Chuck Sexton, that wasn’t enough. In his quest to explore Texas bird life, he resolved to visit every far-flung corner of the state. Texas has eight corners — places where the state boundary takes a sharp turn in one direction or the other. Sexton, a retired wildlife biologist with the U.S. Fish and Wildlife Service, had visited several of the corners already. He’d birded El Paso. He’d been to Sabine Pass, South Padre and Dalhart. Six or seven years ago, he decided to bird all the corners, inspired by the Texas Ornithological Society’s Texas Century Club challenge of finding 100 bird species in 100 different counties. Corners are often places overlooked or unseen, where dust tends to accumulate and the unwanted residue of daily life builds up. What did Sexton find when he started poking around these angular outposts of Texas? In visiting all the corners, Sexton deepened his appreciation for the wildly varied habitats of the state. Greg Lasley, left, and Chuck Sexton at the spot where Texas, Oklahoma and New Mexico meet. Sexton traveled to many of the corners with his good friend Greg Lasley, a noted Texas naturalist and wildlife photographer. When they get together, Sexton and Lasley quickly fall into the familiar back-and-forth of old friends who have built up the patina of friendship through decades of time spent together. They interrupt each other, finish each other’s sentences, reminisce about memorable trips, point out each other’s good qualities and don’t hesitate to give each other a hard time. “You are. I’m not,” retorts Lasley, who, at 67, is two years younger than Sexton. These quests for the corners provided them with a series of geographic adventures that tested their navigational skills, offered prime bird-watching opportunities and gave them an excuse to hit the road together. On to the corners! A modest beginning will allow a spectacular finish, so we start with the last corner that Sexton visited, a corner that ranks low in bird diversity. Sexton traveled to this West Texas corner in April 2016 to complete his corner project. Kermit is the closest town to the corner in the Permian Basin, a land of oil wells and sand dunes. The arid land contains mesquite and Havard shin-oaks, the same type of low-growing oak found at Monahans Sandhills State Park. The lack of water inhibits bird diversity, but there are hidden treasures even here. 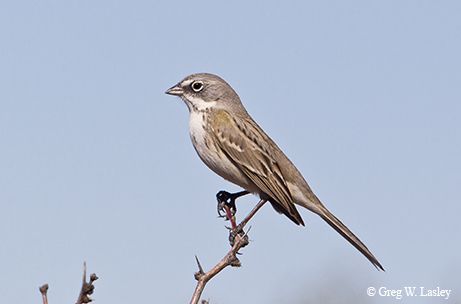 It’s a good place to find a couple of dry-climate species that aren’t easy to find in other parts of Texas: the crissal thrasher and sagebrush sparrow. Sexton found water, an important factor for birds, at the Winkler County Country Club, where he spotted 15 bird species. In adjacent Loving County, the U.S. county with the lowest population, birders have the opportunity to amass a bird list longer than the list of human residents in the county (82 people in the 2010 census) — one of the only places in the U.S. with that distinction. 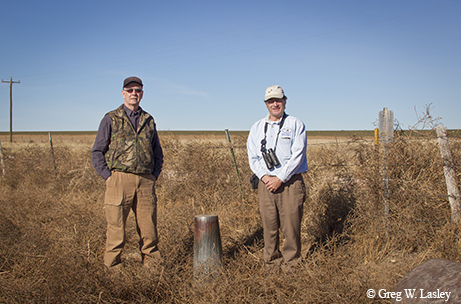 Sexton and Lasley have been birding in the Panhandle on several occasions to see raptors, especially in winter. 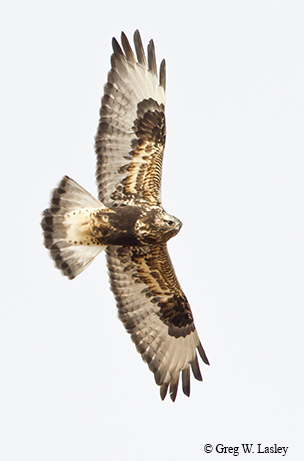 Ferruginous hawks, rough-legged hawks, golden eagles, prairie falcons, American kestrels and more make for excellent winter viewing along Panhandle county roads. Shortgrass prairie once stretched for miles in this part of the state, where bison roamed and prairie dogs dug underground homes; now, much of it has been converted to cropland. Today, nesting birds in the grasslands provide a treat for birders: Western meadowlarks sing their sweet-tuned songs from the tops of fence posts, long-billed curlews probe for food with their oversized beaks, and burrowing owls pop out from their holes in the ground. Fun fact: The place where New Mexico and Oklahoma meet is actually a couple of miles east of the northwest corner of Texas. Of all the corners, the Panhandle’s northwest and northeast corners have the most similarities, but differences do exist. The northeast corner sits at a lower elevation, and the grasslands are a little more intact. Sexton and Lasley navigated the straight-line county roads up in that part of the state to get as close as they could to the corner, within a few hundred yards. 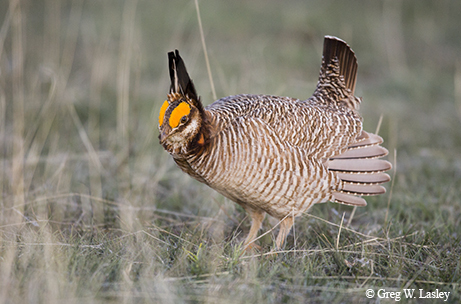 With intact grasslands, the area remains a stronghold for the threatened lesser prairie-chicken, legendary for its showy courtship displays. Sexton, unwilling to pay a rancher to see a lesser prairie-chicken, failed to see one for years (he’s been birding in Texas almost a half-century). Finally, in April 2016, using Google Earth to look for appropriate habitat and keeping track of reported sightings, he saw some lesser prairie-chickens fly overhead at a Panhandle location he declines to disclose. On one Panhandle trip, Sexton and Lasley came across a massive flock of Lapland longspurs, numbering in the thousands, in a sorghum stubble field. The long spurs nest in Alaska and winter in the Panhandle. Sexton and Lasley decided to play a Lapland longspur call; before long, they were swarmed by the birds. “It’s a real special experience to watch 10,000 birds swirling all around you on a cold winter day in the Panhandle, to realize all of them came from Alaska and Canada and are here to spend the winter in Texas,” Lasley says. The Red River leaves the Panhandle and becomes the state’s northern border near Childress at this corner of Texas. The nearest place to the corner on the map is the ghost town of Garden Valley. “This is an interesting region because it’s a blend zone,” Sexton says. Eastern species meet western species at this ecological crossroads. 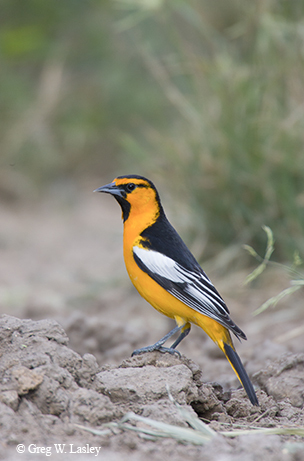 The western Bullock’s oriole might cross paths with the eastern Baltimore oriole. Indigo buntings from the east might share a tree branch with lazuli buntings from the west. Black-crested titmice have been known to mate with tufted titmice in this area, producing hybrids. The region was historically prairie but now contains mostly mesquite woods. The human-induced alteration of the landscape has produced a situation where the two different species of titmice are able to meet and hybridize; scientific papers have been written on the topic. “Boy meets girl, and the story continues,” Sexton says. The Red River connects the Garden Valley corner to this corner north of Texarkana, dominated by pine forests and river bottomland. 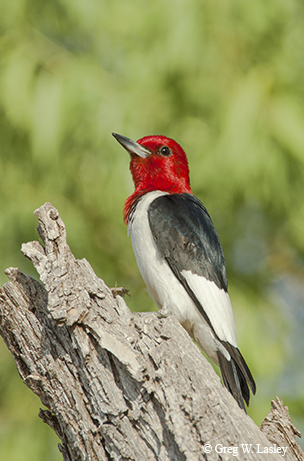 Six nesting species of woodpeckers can be found: hairy, downy, red-bellied, pileated and red-headed woodpeckers and the northern flicker. A century ago, birders might have seen some now-vanished species: ivory-billed woodpeckers, Carolina parakeets and passenger pigeons. It’s birds, birds, birds in this corner, where the Sabine River meets the Gulf, with the bird diversity increasing dramatically compared with the northern corners. Freshwater marsh, brackish marsh, salt marsh and patches of woods provide a wide range of habitat for birds, with plenty of water to go around. Herons, egrets, gulls and terns are common throughout the year. Clapper rails, seaside sparrows and marsh wrens are permanent residents. The spectacular spring migrations are a big draw for birders, bringing in colorful warblers, orioles and buntings. The actual corner of the state is beyond the well-trod hot spots such as Rollover Pass and High Island, and that’s one reason Sexton and Lasley like it. Jetty Road — potholed, half underwater and still showing damage from hurricanes — heads south from Sabine Pass through Texas Point National Wildlife Refuge and finally dead-ends. There, they see lots of birds and almost no people. “Only fishermen and crazy birders go there,” Sexton says. No one would guess that El Paso would have almost the same number of bird species as the upper Texas coast, but look at the numbers: El Paso County has tallied 362 species, while Jefferson County in the southeast has tallied 380. That’s pretty remarkable for such an arid region of the state. The bird life is very different, but tremendous diversity exists there. “It’s a really, really interesting area,” Sexton says. El Paso has desert, parks, tree-filled neighborhoods, the Franklin Mountains, the Rio Grande and nearby reservoirs. It’s on a migration corridor, and the city works as a magnet for stray birds that find themselves in the desert and want to find cover. That combination of factors has led to an amazing bird list. Greater roadrunners, Gambel’s quail, pyrrhuloxia and cactus wrens nest in the area. 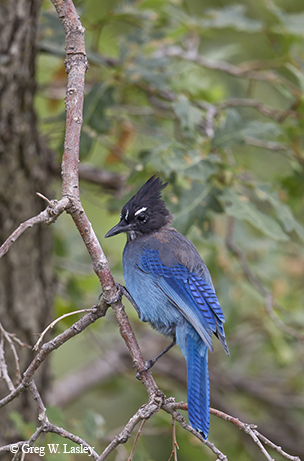 Rocky Mountain birds such as Steller’s jays, Lewis’s woodpeckers and pygmy nuthatches often come down for the winter, making El Paso one of the few places in Texas to see some of these mountain species. We’ve saved the best for last. The Lower Rio Grande Valley is a birder’s paradise, with the greatest diversity of birds in the state. The Valley marks the northern edge of the range for many subtropical species, making it the only place in the U.S. where some birds can be found — green jays, plain chachalacas, groove-billed anis and great kiskadees. Plus, it’s on a migration corridor, with birds moving through each spring and fall. Migrating broad-winged hawks have been reported in the thousands, and dozens of warbler species pass through. To get to the true corner, Sexton and Lasley left the brushlands of the Valley behind and traveled to the saline marshes and beaches east of Brownsville, where the Rio Grande empties into the sea. The usual terns and gulls are there, and mangroves provide nesting spots for herons and egrets. Lasley helped document the first Texas record of a “mangrove” yellow warbler in the area. Reintroduced aplomado falcons may be seen soaring overhead, and a sighting of this elegant bird would make a fine finale to a tour of the far-flung corners of Texas.